One of the newest slot car race sets released from Carrera, the D132 (which is short for Digital 1/32) Hybrid Power Race Set, item #30173, comes with everything you need to play. And boy will you be able to play with this set! To assist me in reviewing all the neat features and benefits of this set, I’ve enlisted two of my kids. 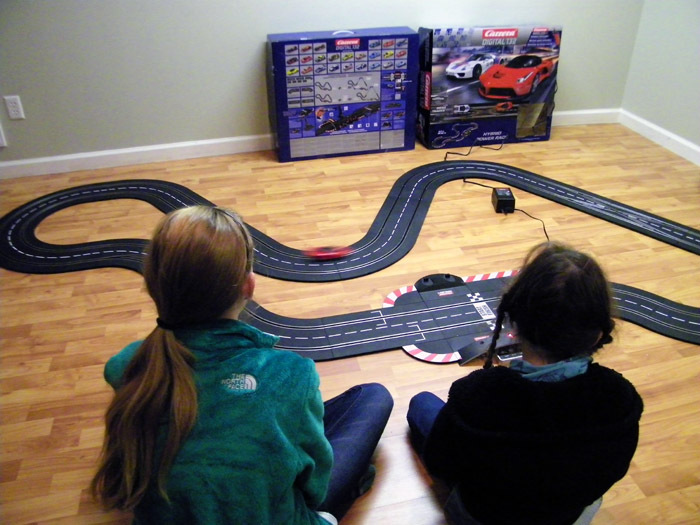 This will offer you a family review of the set, which is what slot car racing at home is about; doing something with your family that is fun!. Of course, as we know, most of the time if kids like it, you know it’s a winner. And since we’re not dealing with Brussels sprouts, I know the kids will like it! We began unpacking the parts from the box, organizing them in stacks by like parts. While the package contains many parts, they are all easily identifiable. The set came with a very nice operating manual that goes into every detail of the set including how to set up the track as well as how it operates. The manual is very lengthy for parents with kids who are eager to race, so thankfully, Carrera included a ‘Quick Start Guide’ with the set. The ‘Quick Start Guide’ covers all the necessary steps to get everyone ready for playing quickly. While the ‘Quick Start Guide’ allows for fast play, I recommend reading the operating manual in order to use the set to its fullest. While it is not hard to operate the set, the more you understand all the parts and how they work, the more fun you and your family will have with it. Also included in the set is a product warranty card. This card should be filled out and returned so that, should you need a part replaced under warranty, Carrera can more quickly assist you. Additionally, this card allows Carrera to contact you should there be any recalls that you need to be aware of. So take just a few minutes and fill this card out and return it. As we continued to unpack the parts, the kids made their way to the cars. The Hybrid race set contains two digital cars, a Porsche 918 Spyder in a race livery, and a Ferrari LaFerrari in a street livery. If you didn’t know, this set gets its name from the fact that both of the actual cars represented as slot cars in this set are hybrid cars. This means that the cars operate as both electric and fuel combustion. You can find more information on these cars by doing a simple internet search. You’ll find that the D132 Porsche 918 Spyder and Ferrari LaFerrari look almost identical to their full scale counterparts. 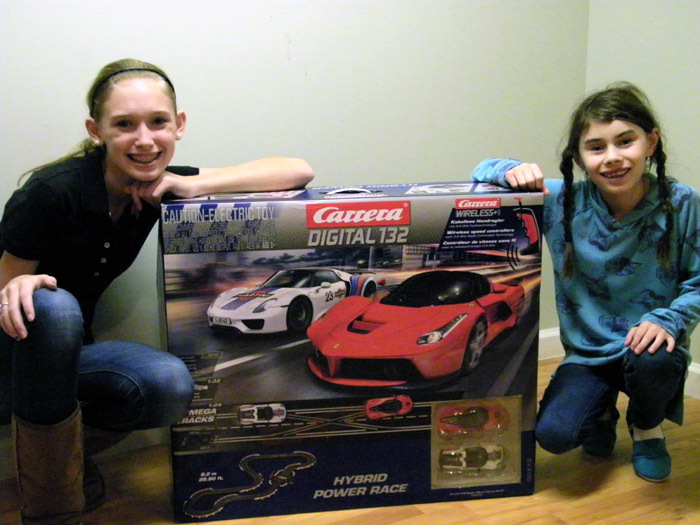 Katelyn, 11, picked up the Ferrari LaFerrari, looked at it a bit and said, “These cars are really detailed.” At about the same time, Kelsey, 8, grabbed the Porsche and exclaimed, “I like the stripes!” As with all the newest offerings of cars from Carrera, the detail on the cars is impressive, especially considering their low cost. There is lots of value in those little toy cars when it comes to quality and fun. As we finished unpacking the box of parts, Katelyn said, “Man! How big is this track?” The Hybrid race set comes with twenty eight feet of track that sets up in a 10’ by 6’ area. While this isn’t the largest set offered by Carrera, it affords plenty of racing action along the 28’ of track. And if you consider that you can race your car in both lanes, that essentially doubles the length! Should you decide that the track needs to be bigger, additional track sections can be purchased to add on to your existing set. 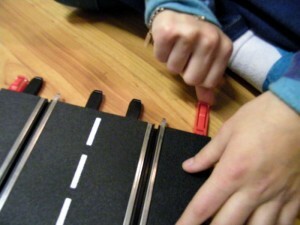 As we put the track pieces together we made sure to use the interlocking red clips that came with the set. These clips help to ensure that the track stays together where each piece is joined to the next. We found that inserting the clips into one end of the first piece of track that we started with and then adding the next piece of track was the easiest way to install them. Just repeat the process until you have the entire track assembled. It goes rather fast once the first couple of track sections are joined. We worked our way around the track piece by piece which brought us to the first digital section of track. So I showed them the lane change pieces and explained to them how they worked as we assembled them. 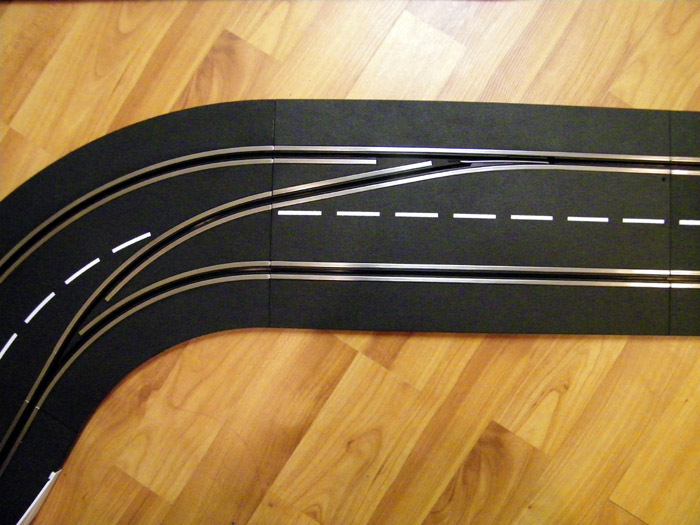 We continued putting the rest of the track together as indicated in the instructions, which included another lane change section, the power base and the controller charging station. Controller charging station? Yep, that’s right, the controllers use rechargeable Li-po batteries (included) and charge on a special piece of track border. 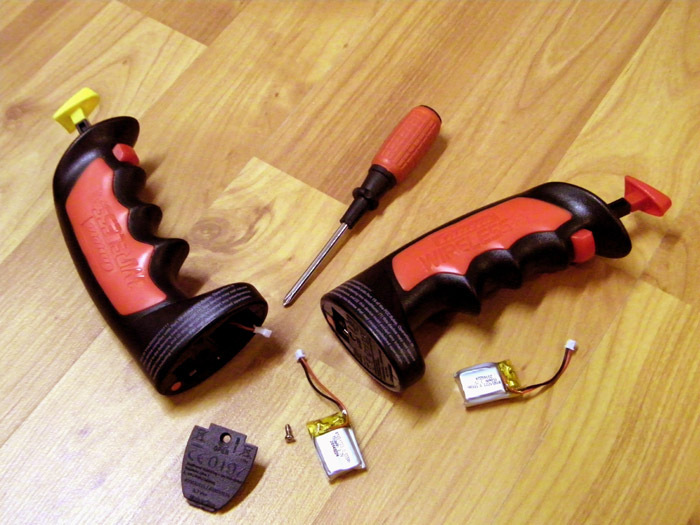 Not only are the controllers battery operated, they are wireless. The controllers feature 2.4 GHz technology and are good up to a range of about fifty feet or so. Upon seeing the controllers, Katelyn asked, “Are these controllers cordless? Awesome!” So not only was Katelyn excited, I was as well. Having wireless controllers means that the kids, and adults, won’t be getting tangled up in cords and we don’t have to stay right next to the track. We found that the controllers responded just like the wired versions. They are easy to use and easy to charge. One more feature is interchangeable color coded plunger buttons. This allows racers to be assigned a color which helps keep things straight. Installation of the batteries is fairly simple though the plugs are very small. Even my daughter with small fingers had a hard time with them. A slightly longer pigtail on the controller would be helpful. You will need a small screwdriver to remove and reinstall the battery cover since a screwdriver is not provided. I think that Carrera could easily include a low cost screw driver for this making it a true ‘everything in one box’ product. Included in the set are sections of ‘guardrail’ that can be installed in key turns around the track. These barriers help to keep the cars from getting too far off the track should the racing become a little heated. When the racing is side by side, racers tend to push the car to it’s limits causing the car to deslot from time to time. Just like real cars, you have to slow down in the turns! The barriers are held into place with clips which snap onto the edge of the track. 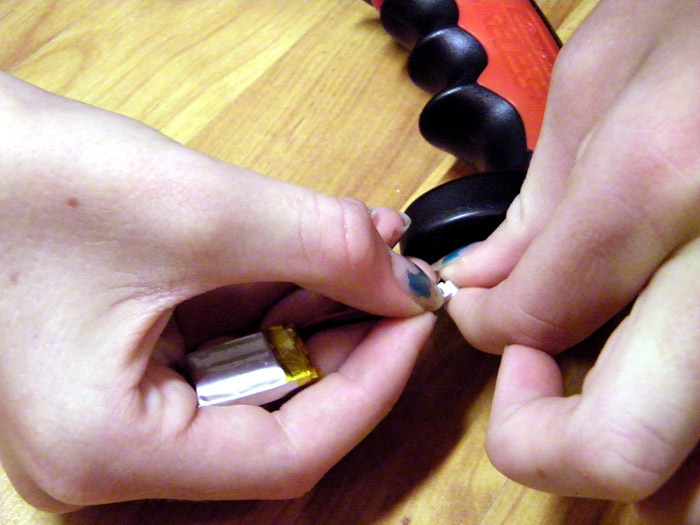 Then the barrier slides into the clips which can then be adjusted left to right as necessary. 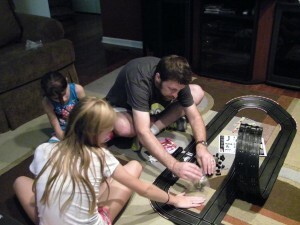 Now that the girls and I had the track assembled, we were ready to start playing. With that overview of the set and how some of the parts function, let me get back to what slot car racing is…it’s all about F-U-N! That is a simple three letter word that is sometimes easy to forget exists these days. 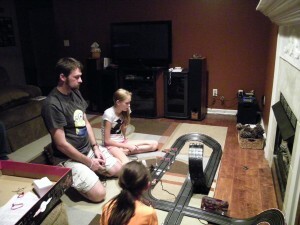 My daughters and I, after setting everything up, enjoyed lots of racing. What is great though, is that while we were having fun racing, we were also talking to one another and interacting in ways that families should. When someone would drive too fast into a corner and deslot, we’d all laugh and joke about it. Sure, there is a time for serious racing and if you want to do that, this set, as well as the others offered by Carrera can provide that, but at the end of the day, it’s all about the fun. With fun comes great memories and an environment where families can break free from the chaos of life and just smile and relax. 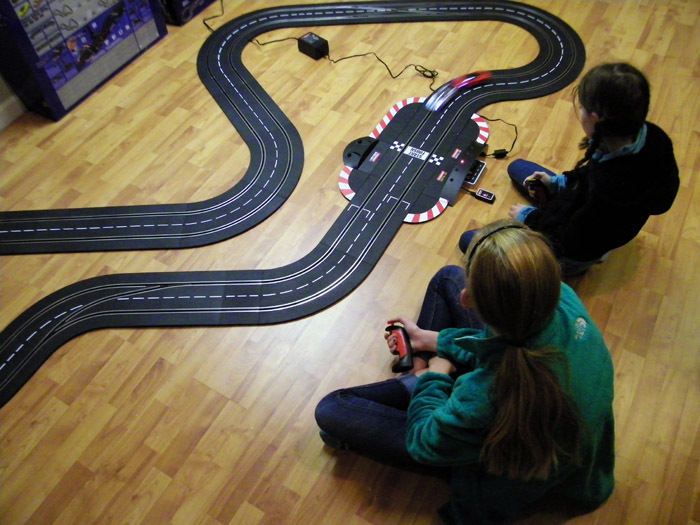 My kids will tell you just how much fun racing slot cars is if you ask them. Guess what? So will my wife. Slot car racing is something that the whole family can enjoy. While there technically can be one winner, after only a few laps, it will be easy for you to see that everyone is a winner by nothing more than the smiles on the faces of each racer, or even those just watching. So give this set a try, you and your family will be glad you did! 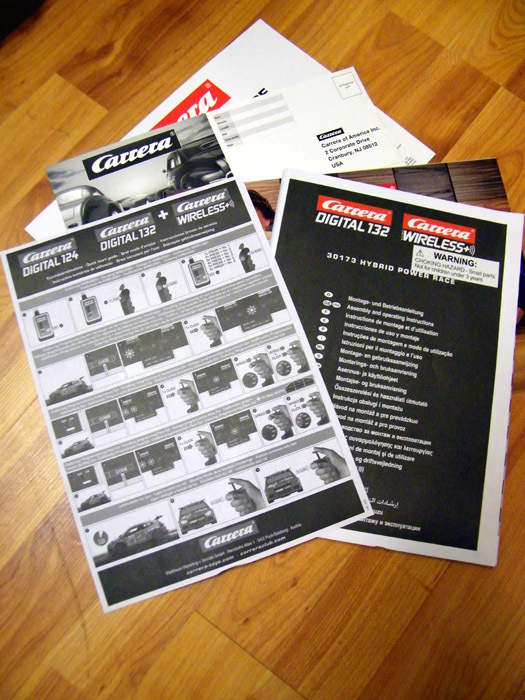 This entry was posted in Carrera Digital 132, Product Reviews, Slot car sets and tagged Carrera Digital 132, slot car race sets, slot car sets, slot cars on February 20, 2016 by admin. 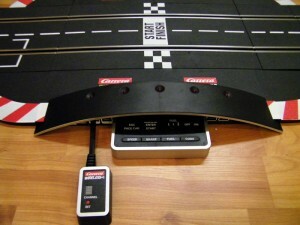 A Carrera Digital Slot Car Set: The Perfect Holiday Gift! 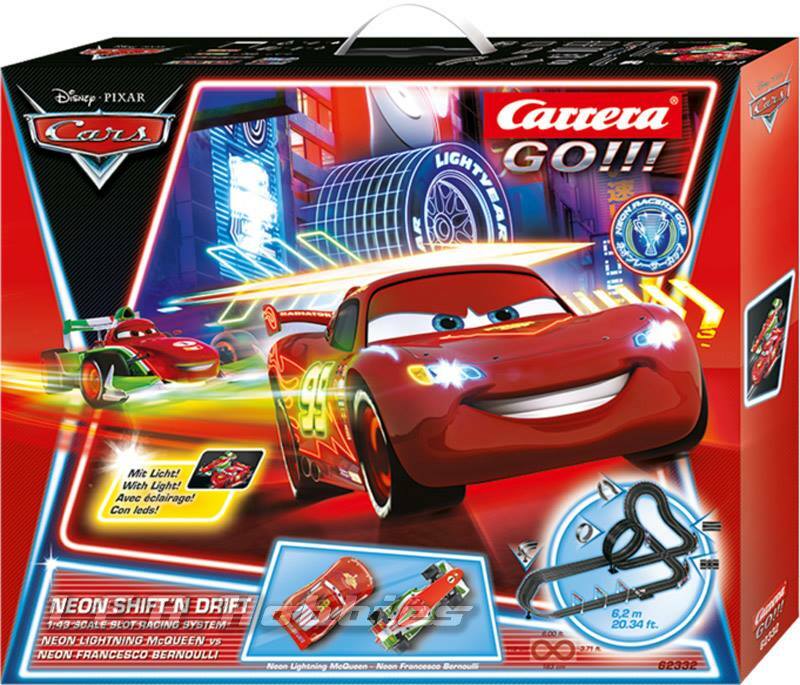 With so much technology for families to get wrapped up in these days, unwrapping a Carrera Digital slot car set this Christmas is the perfect way for families to unplug. How so you ask? As you know there are smart phones, tablets, e-readers, gaming consoles, and more, that kids as well as their parents are deeply rooted to. We are more concerned about checking our social media pages to see what the Jones’s are up to than we are at spending time as a family. We just can’t seem to put the gadgets aside these days. Gone are the days, for most, where families sit around the kitchen table and play cards or board games. It seems that unless there is a computer chip of some sort coupled with an LCD screen to look at, we’re just not interested. What is this slot car set that I mentioned? To keep the answer simple I’ll offer you this. A slot car is an electric powered toy car that runs on a plastic track that resembles a road. The car is guided around the track by a ‘guide’ or ‘guide flag’ in the bottom of the car which rides in a slot within the track. So that’s the simple version. A digital slot car track works the same way except that the cars, with help from special track sections, have the ability to switch lanes. 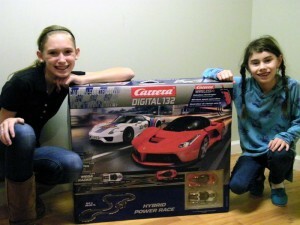 Let me tell you about that Carrera Digital 132 slot car set that recently made its way into our home. The set is called D132 (which is short for Digital 132) Hybrid Power Race Set and comes with everything you need to play. Two of my kids, both girls, saw the set and liked the cars that were in the set, a Porsche 918 Spyder and a Ferrari LaFerrari. Yeah, they have expensive taste in cars, but no matter, the toy versions are very affordable. When the set arrived, we began unpacking the parts, laying them in piles respective to what they were. While the package contains lots of parts, they are all easily identifiable and assemble simply. 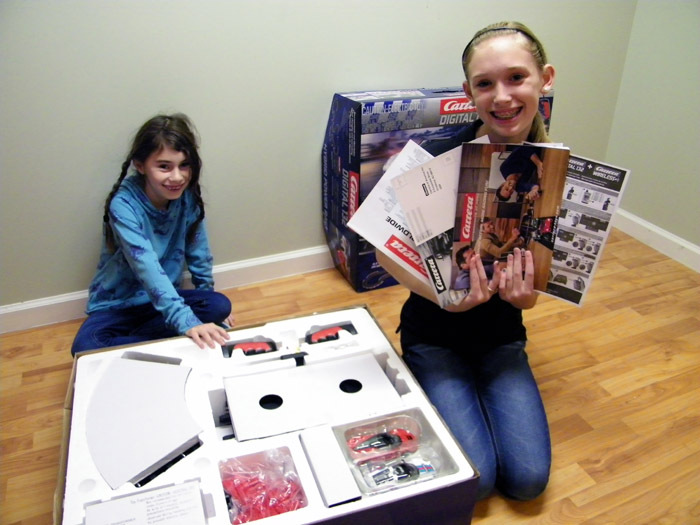 As they unpacked the parts, they made their way to the cars that they had seen in the catalog and online. Katelyn, 11, picked up the Ferrari LaFerrari, looked at it a bit and said, “These cars are really detailed.” While Kelsey, 8, grabbed the Porsche and exclaimed, “I like the stripes!” As with all the newest offerings of cars from Carrera, the detail on the cars is impressive, especially considering their low cost. There is lots of value in those little toy cars when it comes to quality and fun. As we finished unpacking the box of parts, Katelyn said, “Man! 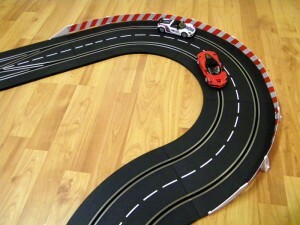 How big is this track?” The Hybrid race set comes with twenty eight feet of track that sets up in a 10’ by 6’ area. We began putting the track pieces together making sure to use the interlocking red clips that help to ensure that the track stays together. We found that inserting the clips into the last piece of track and then adding the next piece of track was the easiest way to install them. We worked our way around the track piece by piece which brought us to the first digital section of track. The girls liked the set when they saw it because of the cars that were in it. Once I explained to them that the set was digital and the cars could change lanes, they were really excited! So I showed them the lane change pieces and explained to them how they worked as we assembled them. 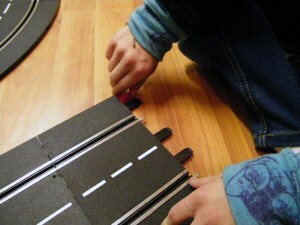 We continued putting the rest of the track together as indicated in the instructions, which included another lane change section, the power base and the controller charging station. Controller charging station? Yep, that’s right, the controllers use rechargeable batteries (included) and charge on a special piece of track border. Not only are the controllers battery operated, they are wireless. What does that mean? It means that there are no cords to get tangled up and that racers can move about the track to find their ideal viewing position. The controllers feature 2.4 GHz technology and are good up to a range of about ten feet or so. Not only will our family be unplugged from all the distractions to race cars, but our controllers will be ‘unplugged’ as well. 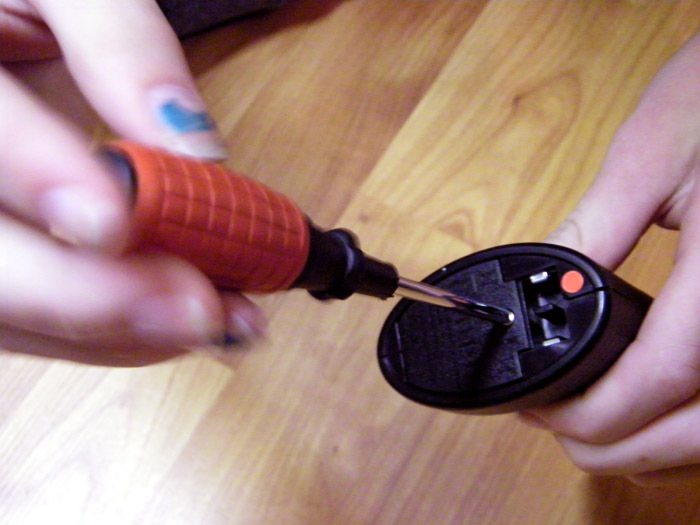 Upon seeing that the controllers were wireless, Katelyn asked, “Are these controllers cordless? Awesome!” So not only was I excited to know that kids wouldn’t be getting tangled up in cords any longer, the kids were excited too. Once we began playing with the set, they each found a spot that they liked and sat and raced their cars. Another great benefit to the wireless controllers, is that parents can separate the little ones a bit to keep some of the ‘drama in the race pits’ from getting out of control. 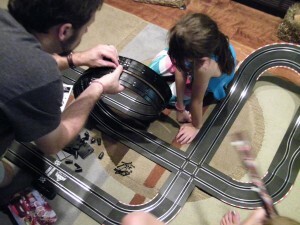 Of course, if dad and mom get a little too competitive, the kids can put them in separate corners to race as well. 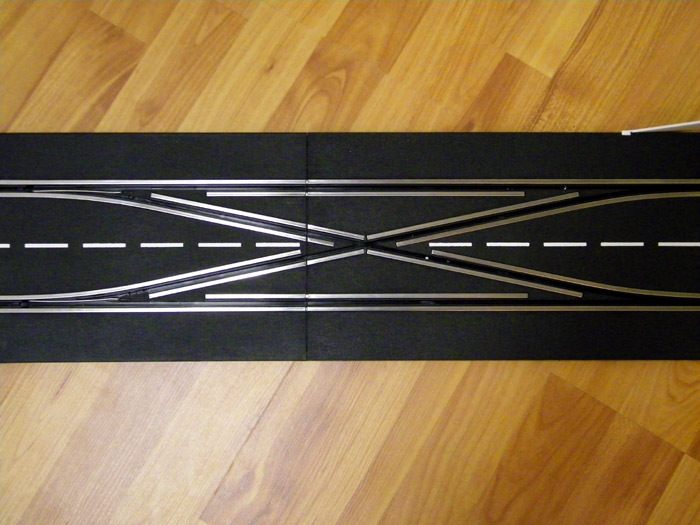 Included in the set are sections of ‘guardrail’ that can be installed in key turns around the track. These barriers help to keep the cars from getting too far off the track should the racing become a little heated. When the racing is side by side, racers tend to push the car to it’s limits causing the car to deslot from time to time. The barriers are held into place with clips which snap onto the edge of the track. 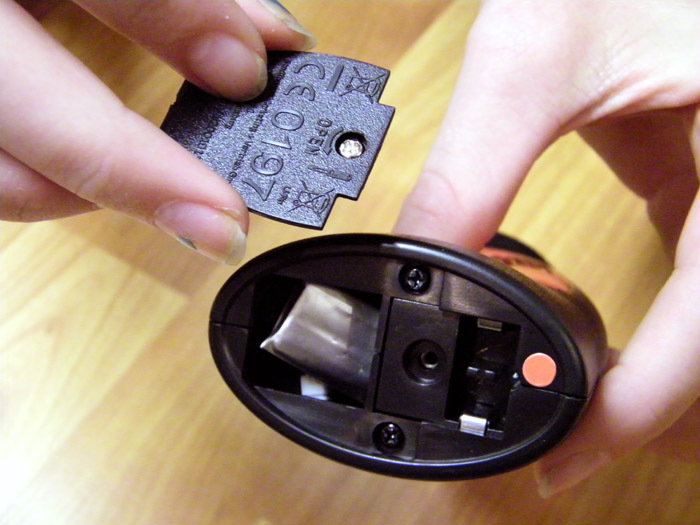 Then the barrier slides into the clips which can then be adjusted left to right as necessary. 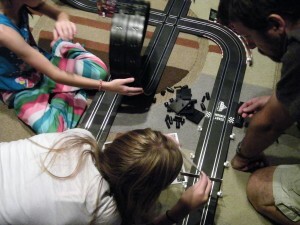 Now that the girls and I had the track assembled, we were ready to start playing. The set came with a very nice operating manual that went into every detail of the set and how it operated. However, that manual is very lengthy for parents with kids who are eager to race, so thankfully, Carrera included a ‘Quick Start Guide’ with the set. The ‘Quick Start Guide’ covers all the necessary steps to get everyone ready for playing quickly. For a little better understanding of what digital racing is about, I’d like to go over the things that you can do with the set and cars before I tell you about the experience that my daughters and I had playing with the set. Digital racing from Carrera offers a nice selection of things that can be adjusted to help you and your fellow racers enjoy the experience. Aside from each controller being assigned to a car, the control unit, which is like the brain of the set, has various functions that you can control. These items include programming the maximum speed allowed, the amount of braking, the lights of each car, and fuel tank capacity. In addition, a pace car can be programmed so that one can race against the control unit if racing alone, or as many as 6 cars, either 6 racers or 5 racers and a pace car, can race at once on the same track. The speed control allows the user to set the maximum percentage of speed that a car can go. For instance, if you set the car to use 100% of the available speed and you press the throttle and don’t let go, the car will fly off the track when you approach a turn. If the maximum speed is set to only 10% of the available speed, the car is much easier to control when entering a turn. The braking effect, also in increments of 10%, determines how quickly the car stops when a racer lets off of the throttle. At a low setting, the car will coast a bit when the throttle is depressed, at a high setting the car will stop almost instantly. Using the fuel capacity forces the racer to stop his car for a ‘virtual’ fill up of fuel. This can be set, also in increments of 10%, to ‘Off’ as well, so that no fuel stops are required. Use of the fuel feature does require Carrera Pit Stop 30356, which can be purchased from the Carrera dealer where you purchased your set. Also, the lights on each car can be turned off or on. This is a neat feature when the fun of racing during the day goes into the night. Most Carrera digital cars come with both headlights and tail lights. The tail lights double as brake lights while racing. 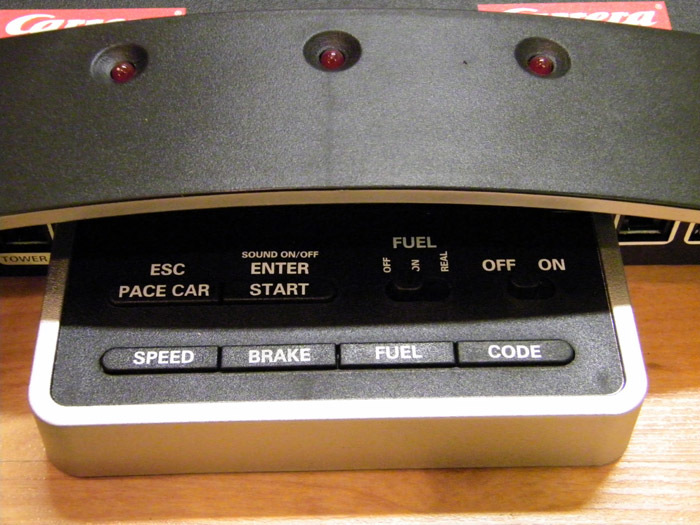 When the throttle is depressed, the tail lights will become brighter indicating braking is underway. With that overview of the set and how some of the parts function, let me get back to why slot car racing is a perfect gift for under the Christmas tree. It is all about F-U-N! That is a simple three letter word that is sometimes easy to forget exists these days. 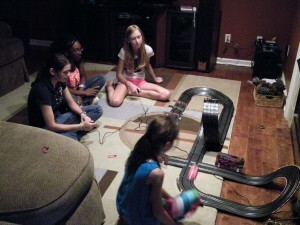 My daughters and I, after setting everything up, enjoyed lots of racing. What is great though, is that while we were having fun racing, we were also talking to one another and interacting in ways that families should. When someone would drive too fast into a corner and deslot, we’d all laugh and joke about it. Sure, there is a time for serious racing and if you want to do that, this set, as well as the others offered by Carrera can provide that, but more often than not, it is all about the fun. With fun comes great memories and an environment where families can break free from the chaos of life and just smile and relax. 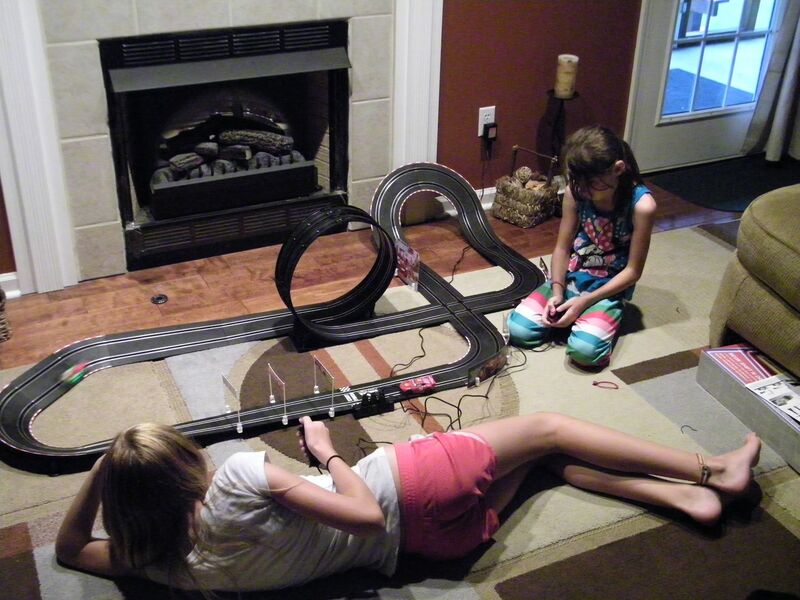 My kids will tell you just how much fun racing slot cars is if you ask them. Guess what? So will my wife. Slot car racing is something that the whole family can enjoy. While there technically can be one winner, after only a few laps, it will be easy for you to see that everyone is a winner by nothing more than the smiles on the faces of each racer, or even those just watching. 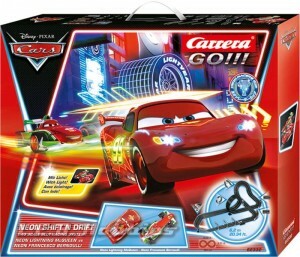 So add a slot car race set from Carrera to your wish list or buy one as a gift for a family that could use some ‘unplugged’ time. While socks, ties, and candy are nice, there is nothing like the fun that a slot car set brings to a family. Merry Christmas! 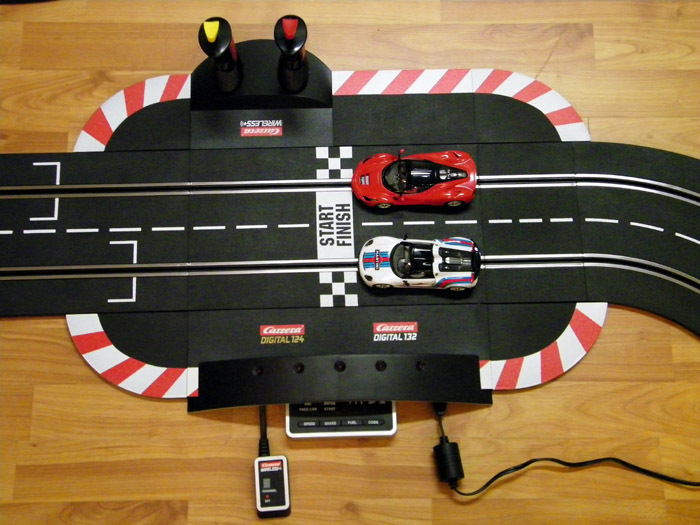 This entry was posted in Carrera Digital 132, Slot car sets and tagged buy slot cars, Carrera Digital 132, slot car race sets, slot car sets on October 28, 2014 by admin. So you want to buy a slot car set, but aren’t sure which one to buy? Which brand is good, better, or best? Which one is best for kids (even though we know it’s for the parents)? Well, perhaps this article will help you to make that decision. We’ll discuss the things to look for in general that will help you get the most out of your new hobby as well as some detailed things to look for. 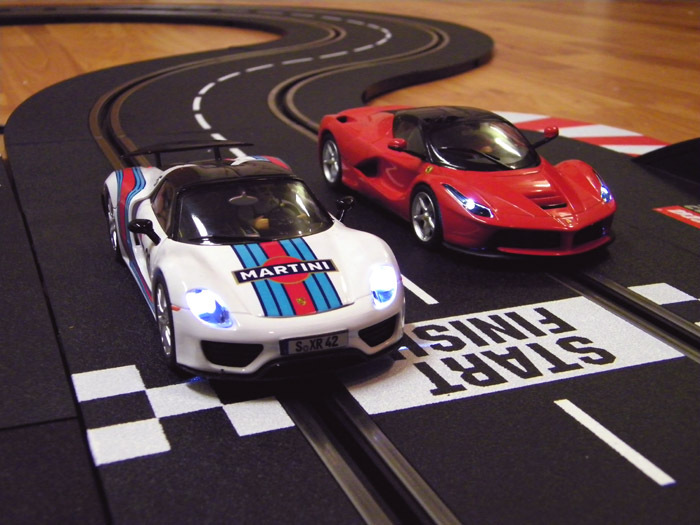 While there are many brands out there, the top brands are Carrera, Scalextric, and Ninco. And, of course, everyone has their opinion to which brand is best. I would like to suggest that you take a hard look at Carrera. My first and foremost reason for recommending Carrera is that their customer service is top notch. Though their quality and craftsmanship is impeccable, on that rare occasion when you do have a problem with a product, they are there to help you out. Not only do they work well with you, the consumer, they also support their dealers. Upon making your purchase, knowing that you can get help when you need it speaks volumes in my book. Now you’re thinking, “Customer service is all good and well, but what about the product? Why should I choose Carrera?” As much as we do not like to admit it, we all shop with our wallets. Meaning that we buy products at the lowest price possible. Usually when you do this, you sacrifice quality. Not so with Carrera. The items in their track sets are extremely well made and durable. When you make a product for the entire family, it better stand up to some rough handling and Carrera has that figured out. Aside from customer service, quality, and value, what makes Carrera stand out? Here are some things to note and keep in mind while you are shopping. No Tools Required! You will get everything you need to start racing as soon as you get your new set home. 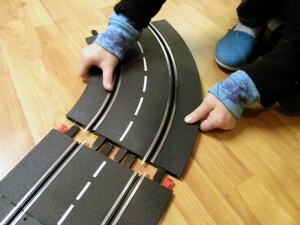 Each set comes complete with the power supply, track, controllers, border, guardrail, and cars. Some sets also come with bridges, banked turns and supports where required. While I won’t cover them here, it’s also worth mentioning that Carrera offers both digital racing sets and wireless controllers. More on that in future articles, so stay tuned. 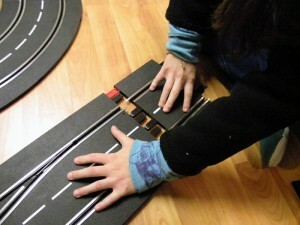 The track pieces go together using a tab-and-slot system as well as clips. The clips help to hold everything in place to ensure that the track gets full power by the way of tight connections between track sections. Carrera offers the widest track on the market. At 198mm (7.79”), it gives you the width needed to run both 1/32 scale cars and 1/24 scale cars as well. And yes, Carrera makes cars in both scales, something no other home set manufacturer currently does. The downside to this larger track is that the track layouts, or designs, sometimes require more space than other brands. This isn’t and shouldn’t be a deal breaker for you though. With an endless possibility of track designs, you’ll be able to create a track to fit the space you have available. Of course, another positive about plastic track sets, is that you can take them apart and store them away when not in use. Though once you see how much fun it is, you won’t want to put it away! Carrera also offers track and cars in 1/43 scale, which are larger than HO, but smaller than 1/32. The track uses a smaller footprint allowing a larger race course to be created. 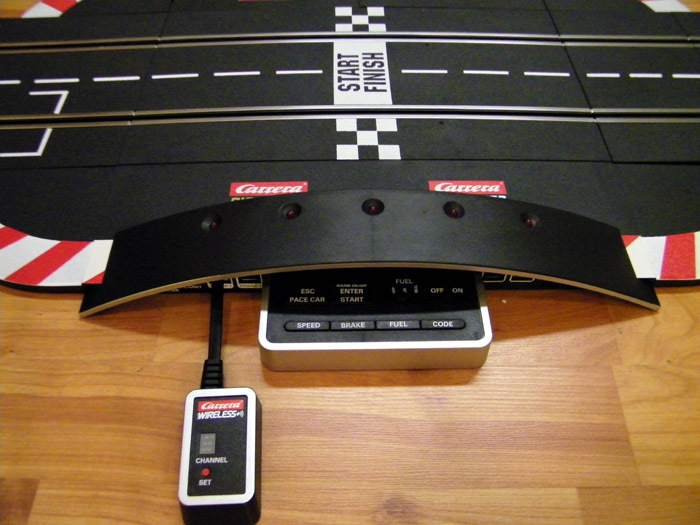 Carrera 1/43 is a great way to get started into slot cars as well. All of the great features of the larger track and cars is also made into the 1/43 system and cars. So if space is a real issue or a smaller track is what you are after, look into the 1/43 sets as well. They are just as much fun as the 1/32 and 1/24 race sets and cars, and there are lots of cars to choose from in this scale as well. A couple of things to note about what makes up each piece of Carrera track; the rails are stainless steel alloy and the track is made from durable ABS plastic, not vinyl. ABS will hold its shape under hot and cold conditions, whereas vinyl based track will warp and twist. 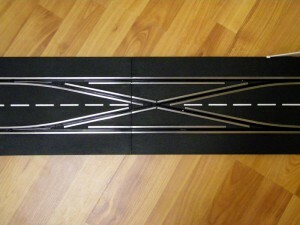 The stainless steel rails that help deliver power to the slot cars will not corrode due to its stainless steel content, and while the amount of magnetism is less than other manufacturers because of this, it’s a small sacrifice that should be welcomed knowing you will not have heavy oxidation or rust on your track, which will occur at some point. Also, the less magnetic rail will afford you the opportunity to see more realistic movements and racing from the cars. To see a car slink through the curves and have a challenging yet fun time making it happen is well worth it. The plastic is rigid and provides a nice surface for the cars to race on. It won’t warp and there is no fear of twisting the track and bending the rails that carry the power. The track is yet another check mark in the ‘Yes to Carrera’ column of your shopping list! 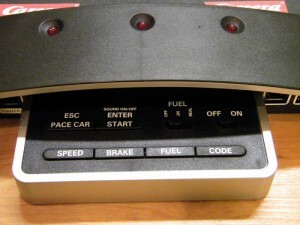 The controllers that Carrera makes are called ‘thumb controllers’, meaning that you use your thumb to actuate a ‘button’ on the controller to make the car go. For me, this type of controller is much more comfortable to use than a pistol grip type of controller where you use your index finger to pull a trigger to make the car go. The controller from Carrera fits in your hand comfortably and is light weight so you won’t get tired of holding it. With each Carrera set, you get two cars that are ready to run. 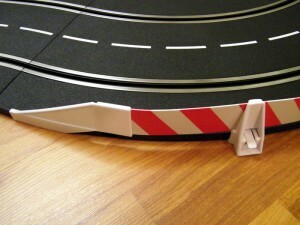 Once your track is setup, look over the guide that comes in the set on preparing the car to run on the track. This guide offers simple tips to allow you to get the most fun out of your racing experience. Part of that fun is that no tools are required for preparing the cars so racing can happen quickly. Speaking of cars, there is what seems like an endless selection. From street cars, to classic and current race cars, there is something that everyone will like. 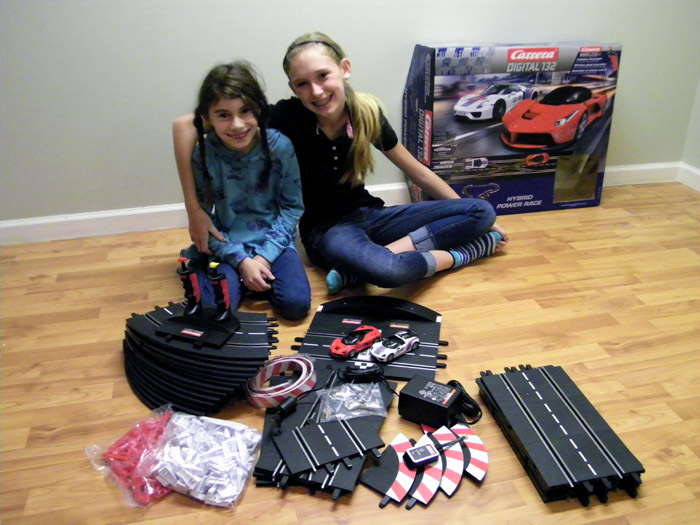 Each car comes with some spare parts that can include braids, mirrors, or guides. Just a nicety that Carrera does to add more value to your purchase. So, add yet another check mark in the ‘Yes to Carrera’ column of your shopping list! 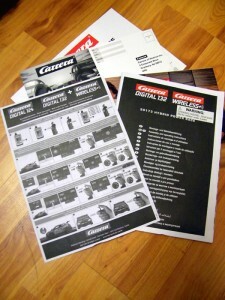 Your final selection, should you choose to make it, should have the name ‘Carrera’ on the package. There is no doubt that the products from Carrera are unrivaled. That’s why they are now the #1 race set brand worldwide! They must be doing something right, and that something is found in the smiles and fun that you’ll have with their products! So pick up a set today, you’ll be glad you did. This entry was posted in Slot Car Overview, Slot car sets on June 25, 2014 by admin.